iPad Maps is pretty smart; it can figure out where you are at any point in time and display your current location using GPS technology (with a 3G/4G model) or a triangulation method (Wi-Fi model). You must have an Internet connection and turn Location Services on in iPad’s Privacy Settings; your location can be pinpointed more exactly if you have a 3G or 4G iPad, but even Wi-Fi models do a pretty good job, and do even better when you’re surrounded by hotspots. From the Home screen, tap the Maps icon. Tap the Current Location icon (the arrow shown in the lower-left corner of the figure). Your current location is displayed with a pin in it and a blue circle around it. The circle indicates how accurate the location is — it could actually be anywhere within the area of the circle. Having trouble getting Maps to work? That could be because if you turn off Location Services in iPad Settings, Maps can’t find you. Go to Settings and in the Privacy setting make sure that Location Services is set to On for the Maps app. Double-tap the screen to zoom in on your location. If you don’t have a 3G/4G version of iPad, your current location is a rough estimate based on a triangulation method. 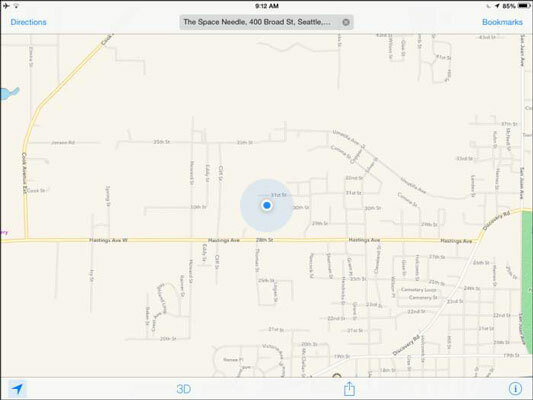 Only 3G- and 4G-enabled iPads with GPS can really pinpoint your location. Still, if you type a starting location and an ending location to get directions, you can get pretty accurate results even with a Wi-Fi–only iPad.